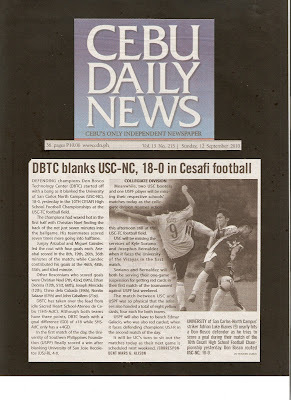 DEFENDING champions Don Bosco Technology Center (DBTC) started off with a bang as it blanked the University of San Carlos North Campus (USC-NC), 18-0, yesterday in the 10TH CESAFI High School Football Championships at the USC-TC football field. The champions had waxed hot in the first half with Christian Noel finding the back of the net just seven minutes into the ballgame. His teammates scored seven times more going into halftime. Junjay Arizabal and Miguel Caindec led the rout with four goals each. Arizabal scored in the 8th, 19th, 26th, 36th minutes of the match; while Caindec contributed his goals at the 46th, 48th, 55th, and 63rd minute. Other Bosconians who scored goals were Christian Noel (7th, 42nd, 69th), Ethan Decena (13th, 51st, 66th), Joseph Mercado (12th), Chino dela Calzada (39th), Nonito Salazar (67th) and John Caballero (71st). DBTC has taken over the lead from idle Sacred Heart School-Ateneo de Cebu (SHS-AdC). Although both teams have three points, DBTC leads with a goal difference (GD) of +18 while SHS-AdC only has a +4GD. In the first match of the day, the University of Southern Philippines Foundation (USPF) finally scored a win after blanking University of San Jose Recoletos (USJ-R), 4-0. 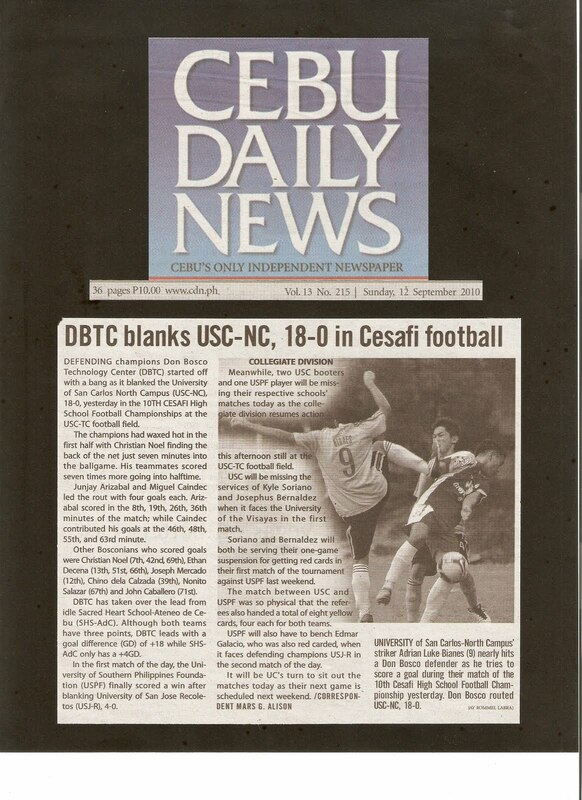 Meanwhile, two USC booters and one USPF player will be missing their respective schools' matches today as the collegiate division resumes action this afternoon still at the USC-TC football field. USC will be missing the services of Kyle Soriano and Josephus Bernaldez when it faces the University of the Visayas in the first match. Soriano and Bernaldez will both be serving their one-game suspension for getting red cards in their first match of the tournament against USPF last weekend. The match between USC and USPF was so physical that the referees also handed a total of eight yellow cards, four each for both teams. USPF will also have to bench Edmar Galacio, who was also red carded, when it faces defending champions USJ-R in the second match of the day.